Our Saturday Soup Swappers are headed south of the border with Mexican soups, perfect for your Cinco de Mayo party in May! You will have time to try these out and choose the perfect one for your gathering. We are hosted by Karen at Karen's Kitchen Stories this month. Karen has a wonderful food blog with all kinds of goodies, but if you like bread, well, you are going to be so inspired over there! 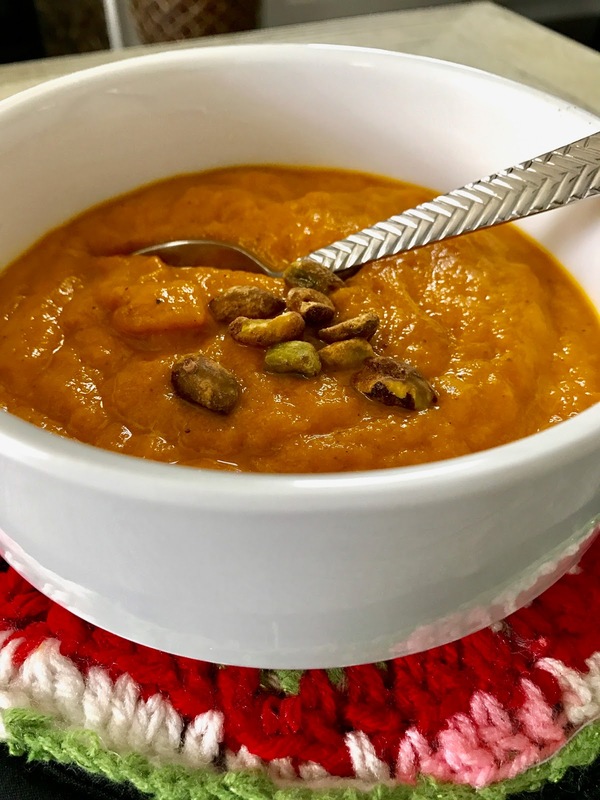 This pumpkin soup has a nice heat and sweetness to it. It is made to accommodate my lifestyle, but I have put the equivalent in "normal" ingredients beside the ones that I use! This soup is thick and perfect with a sandwich of your choosing. Don't you love the sweet pot holder? It was made by my mother in law, Irene, who suffers from Alzheimer's. (In a skillet over medium high heat toast pumpkin seeds for about 3 minutes until browned and you can smell the oils being released. Set aside.) If you use pistachios, skip this step. In a large sauce pan heat olive oil over medium heat. Add onion and sauté until translucent – about 5 minutes. Add garlic and chopped chilies. Sauté for 2 minutes. Add brown sugar, cumin, salt, pepper and red chili flakes. Sauté for another minute and then add the pumpkin, chicken or vegetable stock and coconut milk. Stir well. Reduce heat and cook until heated through (about 5 – 10 minutes). This goes for my files, I always welcome a recipe for pumpkin. soup... so creamy and not too heavy! I love the pot holder and I love the soup sitting on top of it too. Looks tasty, Terri. Pumpkin soup has a wonderful sweet/spicy taste that I love. This sounds delicious. I love the combo of sweet and spicy! Also, I did not know that about the center piece of the blender lid! Great tip! MMM! I love a good pumpkin-based soup! And with a Mexican twist? I'll definitely add this to my meal-plan this week. Everyone in the house is sick right now, so something hearty with a little spice might just be the key to perking us up. I am so making this soon! It is so healthy and the creaminess makes it seem so indulgent- yum! What a beautiful soup! Sounds amazing! I'm bookmarking this to make next fall. Love the combo of ingredients. So, I really can't wait to try this one...it sounds fantastic! I love the flavors of pumpkin within recipes. This dish looks so creamy and appetizing, I would love to sample it. This sounds so delicious! I love topping soup with pistachios or seeds. I'll try this recipe this week!